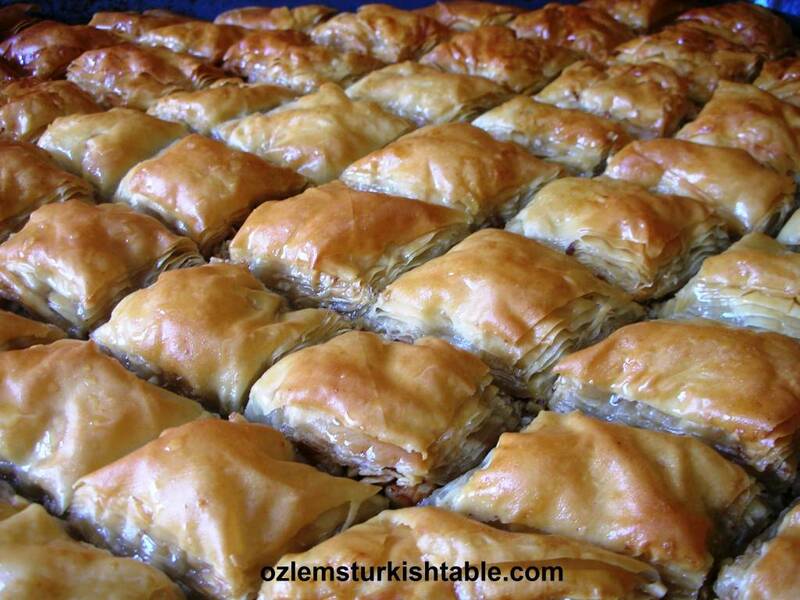 Various kinds of pastries called “borek”, constitute an important part in Turkish cookery. Different sorts of dough can be prepared at home though it is very convenient to buy ready made fresh thin pastry sheets called “yufka” widely available in Turkey. You can substitute yufka with filo pastry sheets as I do for this recipe and it works remarkably well. The filo pastry sheets in the UK come fresh and need to be left in room temperature for 30 minutes before using. The filo pastry in the US comes frozen and you need to thaw them 2 hours prior using. You can also use any filling of choice, meat, spinach, spicy pumpkin, potato, leeks… the list of the possibilities is endless! 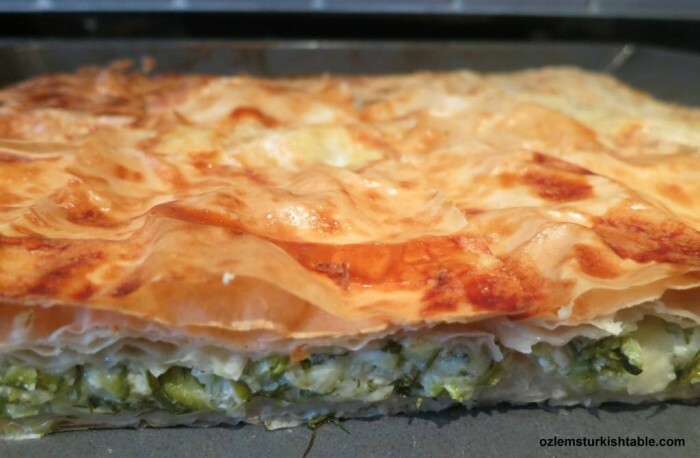 This tasty borek, can be a lovely side dish or first course for dinner parties, they are also delicious for the weekend brunch, Turkish style. For the filling, put the grated courgette (zucchini) in a colander and sprinkle with salt. Set aside for 30 minutes. Squeeze well to allow the excess water to run away. (You can prepare the courgettes this way up to a day in advance and keep in the fridge, covered). In a bowl, combine the grated courgette, feta cheese, grated mozzarella, beaten eggs, chopped green onion and dill. Season with salt and freshly ground pepper. You may wish to leave out the salt if the feta cheese is already salty. 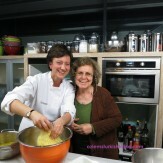 Combine the beaten egg, olive oil and the milk in a bowl and mix well. Generously grease a baking tray with olive oil. Take a filo sheet and covered the rest with a damp cloth. This will help avoid the pastry getting too dry or less manageable. Put a sheet of filo pastry on the tray and brush with 2 tablespoons of the egg &milk; mixture. Continue doing this for the next 5 sheets. Now put the 6th sheet on top and this time spread the courgette filling evenly. Add the next sheet over the top and apply the egg&milk; mixture over the top, making sure the whole surface is nicely covered and moistened. Continue this for each sheet, including the last sheet. Bake the pastry in the preheated oven for about 25 minutes or until the top of the pastries is golden brown and puffed up. Transfer onto a serving plate, and serve. This pastry can be successfully preheated and frozen. Notes:1) If you freeze the cooked pastry, you can reheat at 180C/350F for about 15-20 minutes. Please moisten the top of the pastry with a couple of tablespoonful of milk so that it won’t dry out. 2) If you have any courgette filling left over (as the size of filo sheets vary in different countries), you can knock up a delicious omelet with adding another egg or two. 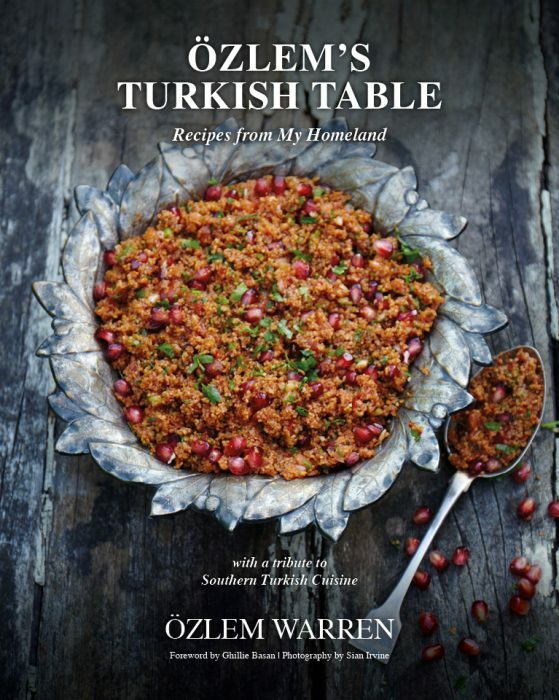 I am still dreaming of the börek I once ate in Istanbul – so I'll try this recipe. Thanks for sharing it. 1) Does the filling need egg? 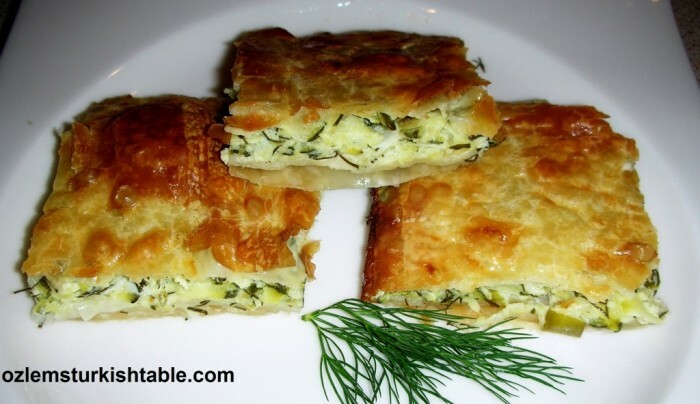 If I used your recipe but made borek cigars, can I omit the eggs? 2) My phyllo sheets are 9 inch by 14 inch. Half a pound of phyllo dough (one package) is approximately 20 to 24 sheets. If I use two sheets of phyllo dough (butter one sheet and then place another one on top), how many cigar boreks can I make from the 2-ply buttered sheets? 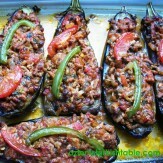 Merhaba, thank you for your note – you can omit egg in the filling if you need to. 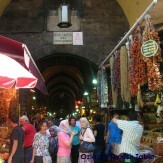 I think with the amount of your sheets, – depending on the length of your cigar borek – you should be able to make min 20 pieces, hope you enjoy making them, Afiyet Olsun. Do you mind the zucchini with the cheeses and then place on dough together or separately ?